This is especially important for small businesses – you likely can’t afford big splashy television ads or radio announcements, so what better way to get your message out to the masses than through the creation of a blog. Post your success stories, talk about charitable causes you support, and demonstrate how your products will solve problems for your customers, all of these will help to build your brand image and reputation. Do you know who your customers really are? The more you know about them and their likes and dislikes, the easier it will be for you to find more customers like them. A business blog is a wonderful opportunity to learn from and interact with your customers and potential customers and can be an invaluable market research tool. The closer your customers feel to you and the more they know about you, the more loyal they will become. When your customers feel like they’re being heard and appreciated they will keep coming back to you. As a small business owner myself I have probably struggled the most with customer service. It is one of the easiest things to let slide when a business is taking off and your attention is demanded elsewhere. 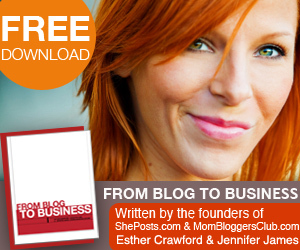 A blog provides you with an easy way to both give and receive customer feedback. If you already have a website for your business, adding a blog that is updated regularly (weekly, bi-weekly, or whatever, it doesn’t have to be updated daily) will increase both traffic and page rank for your site. Because websites tend to stay the same for long periods of time they’re not spidered by search engines as often as blogs are and since your blog will provide keyword rich content about your business to the search engines, your site will benefit in more ways than one! You can start a business blog for as little as $5 a month, where else can you get the opportunity for exposure and a wide open stage for your products and services for only $5 a month? The possibilities to display your products and increase visibility for your business through news, announcements, giveaways and other promotional activities are endless. You don’t have to be a computer geek or a technical wizard to run a blog! Your blog can be up and running overnight even if you don’t have a clue about how to setup or design a website, and updating a blog is easy to do from any place you’ve got web access – just login to the blog, type up your post, add a hyperlink or an image by hitting those buttons then click publish. Check back Thursday for a post on “How to Setup and Run a Blog for Your Business” that will describe all the steps needed to get your blog started! 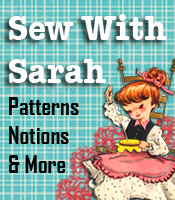 This Sewing Business blog was started on a different platform and later switched over to WordPress. Although the transition was a bit of a pain, it was a great business decision and now we wonder why we didn’t make the move sooner! 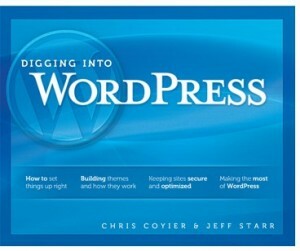 WordPress is one of the most robust and customizable blog platforms available and now there is a terrific new book out called Digging Into WordPress that shows you how to tap all of the potential of WordPress and take your blog to a whole new level. This 400+ page PDF book is written for both beginners and experienced WordPress users and focuses on teaching you how to improve your site using many different techniques, tips, and tricks. Each technique is fully self-contained and provides complete instructions and clear explanations to make implementation a breeze. As you learn how to maximize, optimize and streamline your site, you’ll also get tons of bonus information including “pop-out” boxes and side notes with insider information, and many more awesome techniques to improve your WordPress-powered site. The PDF version of the book is only $27, however you can also pre-order the print version and get the PDF too for $67. Frankly, I prefer the PDF version since you can easily search for what you need and you’re able to copy and paste any code you might like to use. Click here for more information and a preview of what’s inside the book.